Cheerleading. It’s a popular sport that comes with many connotations – some recall high school sporting events, where cheerleaders are in charge of pepping up the crowd. Others think of the intense stunts carried out by competitive cheerleaders. No matter what your own idea of cheerleading is, one can’t deny that it’s a display of grace and strength, sport and art, and spirit and skill. There’s a lot more that goes into cheerleading beyond pompoms and pep. Proper technique, equipment, practice, historical background, and understanding of similar sports all contribute to a good cheerleader. So, Who Is a Cheerleader? Anyone with the desire to cheerlead can cheerlead. Cheerleading is not limited to a specific age, gender, or body type. Many will argue that your values, beliefs and the way you carry yourself contributes as much to being a good cheerleader as your physical skill. There is emphasis on the word “lead” in cheerleading, meaning that cheerleaders should be prepared to act as representatives of the organization they are cheering for. Cheerleading can start young and carries up through high school, college, and professional leagues. Many children are able to start cheerleading through either competitive gym teams or recreational teams. Competitive cheerleading, also known as all-star cheerleading, involves stricter training, performing more gymnastics and stunts, and attending competitions in which teams perform routines for judges. Competitive cheerleading makes up national and international leagues and can have cheerleaders from young, elementary aged children to teenagers. Recreational cheerleading typically takes place locally. Many recreational teams are sponsored in junction with recreational sports teams, meaning they share the same logos, mascots and spaces with recreational football, basketball, or soccer teams. Often times, these teams will cheer on the sports teams they share their names with. High school cheerleading focuses mainly on supporting school sports teams at home and away games. These cheerleaders also typically perform stunts and routines during half time shows for the entertainment of the crowd. High school cheerleaders usually perform the type of cheerleading most people think about when they think of the sport. Their main goal is to get the crowd excited for the game while performing fun and exciting stunts. High school cheerleading is often divided into two groups: varsity and junior varsity, or JV. Varsity cheerleaders are typically older, have more cheerleading experience, and perform at varsity level sports games, such as varsity football and basketball. JV cheerleaders are usually younger and perform at junior varsity sporting events. College cheerleading is similar to high school cheerleading in that many college cheerleading squads are formed to perform at sporting events and games. Depending on the size of the college or university, there may be multiple squads and teams to perform at different types of sporting events. Many colleges and universities have official, university sanctioned teams that perform at games, as well as recreational or intermural teams that cheer solely for fun. College cheerleading is also considered to be a more advanced level, meaning stunts and routines may be more difficult to perform. There are also a large number of coed squads in college cheerleading, whereas high school cheerleading is largely made up of females. On a historical note, organized cheerleading is actually rumored to have started in college. In 1877, Princeton University created its “Princeton Cheer” to chant at athletic games. This cheer is still used today. The trend quickly spread around other universities until the University of Minnesota organized a six-member team to cheer at sporting events. Eventually, the sport grew into what it is today. Professional cheerleading is one of the most competitive facets of cheerleading. There are very few professional cheerleading leagues around the world when compared to the number of school and community sponsored leagues. Professional cheerleading also requires a lot of skill; professional cheerleaders must be masters in cheerleading, dance, and gymnastics. Professionals often perform for football, basketball, baseball, and hockey teams. In addition to performing for these teams, the professionals often act as team representatives, doing interviews, appearances, charity work, and more on the behalf of the sports team they cheer for. What Does a Cheerleader Look Like? While cheerleading can be done by any gender or body type, cheerleaders do have commonalities in their appearance in their uniforms, accessories, shoes, and general style while cheerleading. Many gyms and teams have regulations regarding what cheerleaders can wear during practice and performances, typically based on guidelines by competitions, school rules, or national standards. While there are slight variations among uniforms between teams, most follow the same general guidelines. On top, cheerleaders wear a shell, or a sleeveless vest with the school or team logo, mascot, name or colors depicted on the front. This shell can also be in the form of a halter top or a crop top, depending on the squad’s regulations. Some teams require female cheerleaders to wear a sleeved, high neck liner underneath their shell for uniformity and modesty. Regarding bottoms, female cheerleaders typically wear an A-line or pleated skirt that sits on the waistline and reaches the mid-thigh. Underneath the skirt, female cheerleaders wear spandex briefs, also known as bloomers, lollies or bundies, to compensate for shorter skirt lengths. Male cheerleaders will wear track pants of a similar style or color to the females’ skirts for uniformity. Many cheerleaders will also wear their hair in matching styles. These styles often include matching bows that sport the team or school colors that they are representing. If makeup is allowed, cheerleaders also often coordinate makeup looks to match their squad’s. One could argue that a cheerleader’s shoes are the most important part of their uniform. When doing complex and dangerous stunts, proper footwear can mean the difference between injury and success. While in the past, cheerleaders first wore saddle shoes before transitioning to canvas shoes, the cheerleaders of today wear athletic sneakers. There are many important features that make up a cheerleading sneaker. They are very different from an average running shoe, and for good reason. Cheerleading sneakers must be lightweight, have shock-absorbing padding, be made of an easy-to-clean material, be breathable, and have finger grips. Many of these features contribute to the success of stunts. The finger grips, for example, allow for cheerleaders to safely grip onto the feet of flyers when they perform routines. Many people hold the misconception that cheerleading is not a sport or an athletic activity at all. While many people see cheerleading as a “soft” activity, there is actually a lot of training and skill that goes into it. Cheerleading stunts and routines are a mix of dance, gymnastics, tumbling, and vocals that require hours of practice, high flexibility, and a lot of hand-eye coordination. Like most sports, cheerleading squads have leadership that create routines, run practices and coach the team to improve. These leadership roles can come in the form of a team captain, head cheerleader, coach, assistant coach, and more. Responsibilities are divided up differently depending on the squad. 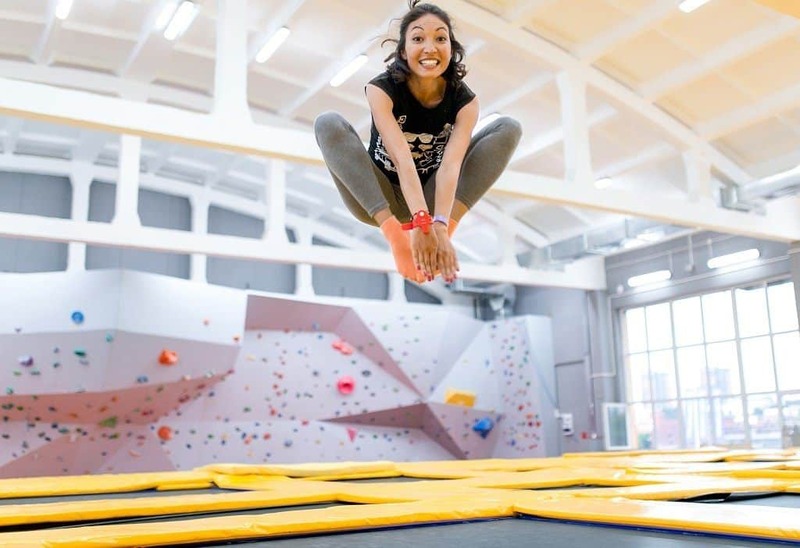 Cheerleading practice is ideally hosted in a gym that is stocked with state-of-the-art equipment like new balance beams, popular tumbling mats, trampolines, landing mats, and more. Cheerleading practice can also be held outside, depending on the squad’s location, availability, and climate. For example, a high school cheerleading team may practice on the school’s football field to keep costs down while a professional cheerleading team may choose to invest in a gym to practice in. Each squad or team requires different equipment, depending on their goal. Many all-star and competitive squads will practice in gyms with top gymnastic mats from brands like Tumbl Trak, Soozier or Polar Aurora. Other gyms, especially those that house practices for multiple sports, may choose to supply their practice areas with mats for martial arts. These mats are essential for cheerleading practice because they provide shock absorption if a cheerleader were to fall. It’s much better to fall on a mat than a wood or concrete floor. Cheerleaders also use many tools and pieces of equipment typically used in gymnastics. Trampolines can be incorporated into more complex routines or just used in practice to help with flips and stunts. Special mats called folding inclines also help cheerleaders train. Younger cheer squads benefit from using different equipment than high school, college, or professional cheer squads. Youth teams should invest in gymnastics equipment for kids in order to maintain proper training. One of the most classic cheerleading stunts is building a pyramid, but the list does not stop there. Stunts can be performed by the entire squad or in small groups; stunts usually involve a flyer, or a cheerleader who is lifted into the air during a stunt. Stunts also involve bases, or people who stabilize the flyer, and a backspot and frontspot to call the stunts out and assist the bases in making sure the flyer does not fall. Cheerleading cheers typically hold special value to the cheerleaders calling them out. They often use language that represents their school or team in a strong, positive light, and are created to inspire the crowd watching them. Cheers are typically simple and easy to remember, often so the crowd can cheer along as well. They are rhythmic, accompanied by clapping or stomping, and rhyme or spell out key words. At the end of the day, cheerleading is much more than what many people see it as. It is a dynamic, multi-level sport that can be enjoyed by people of all ages. Whether you’re a professional cheerleader for the Dallas Cowboys, or just starting out on a recreational youth team, anyone can be brought together by the spirit of cheerleading. Photos from: ViewApart / depositphotos.com, DmitryPoch / depositphotos.com, londondeposit / depositphotos.com, william87 / depositphotos.com, frantic00 / depositphotos.com.